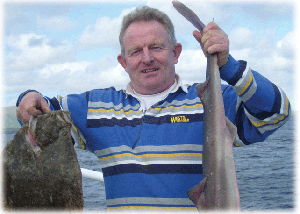 Have you been fishing with Deep Sea Dingle? Have a good fish story to share? Leave you thoughts, comments and stories here. There are no measuring tape here… the fish were as big as you say they were. Deep Sea Dingle is the BEST fishing charter we’ve ever worked with. Captain Rory O’Connor is the perfect guide — knowledgeable and a whole lot of fun along the way. We loved the fact that he had everything covered, supplied everything we needed, and scored us a whole heap of fish! I have been taking students to Ireland for the past 10 years and this past May eight of our students were able to spend the day fishing on the Molly’O. I don’t think any of the students had caught that many fish in their entire lives. The fact the Captain O’Connor was able to work with out hotel to have them prepare the fish for the kids that night made it the highlight of the trip. Thanks to Skipper Rory Sr, and 1st Mate Rory Jr. for an absolute memorable time. Not only did we manage to keep busy catching fish, we all had such a great time and thanks to both Rory Sr, and Jr.
Thier knowledge and ability to get us to the fish is only surpassed by their warm and friendly manner. My entire family thanks you both for making our fishing trip in Dingle a once in a lifetime experience. We went out with skipper Rory O’Connor and his son Rory junior on Saturday the 27th of Aug. There were 11 of us (Tralee Celtic FC) on the boat. We had a fintastic day!! Rory O’Connor what a catch!! Jack Sparrow wouldn’t get a look in!! Great day had by all-thanks a million. Started off as a typical Irish morning rain and wind! We headed south out of Dingle harbour to fish a few marks catching mackeral and pollack.As the tide started to flood we moved on to Wild bank where the fish were more plentiful and larger.You will not get a more helpful skipper than RORY and we can’t wait to go again. Thank you Rory for a great day. We will be in Dingle on the 23 of July. I was wanting more info on a full day trip for five. Would also like to know what we can expect to catch. Not interested in keeping but a few fish to have cooked later that night.